A running list of product updates and changes. Star your favorite lists (4/10). Favorites will appear at the top of each List, Saved Search, Saved Post sections inside your shared dashboards. These favorites are private to you, only you will see them. 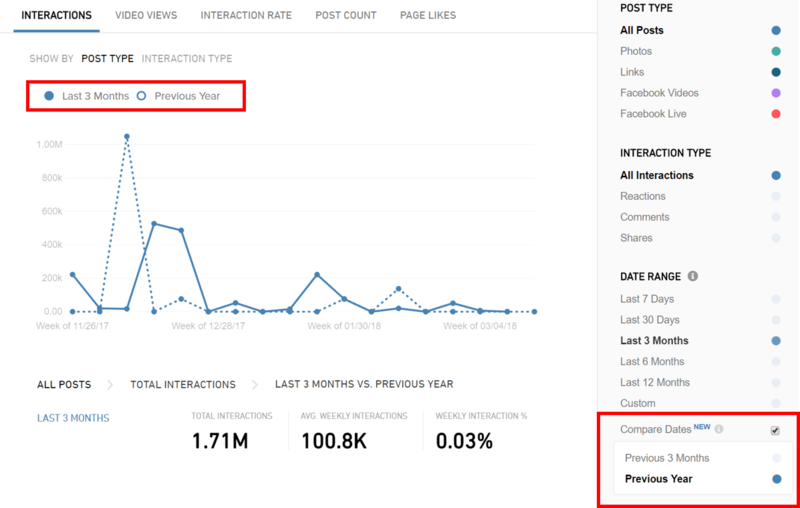 Add Branded Content filter (“as publisher”, “as marketer”) to Intelligence for Facebook and Instagram (4/3) You can now look up engagement metrics over time for a specific account or multiple accounts and compare against each other. This is the same data that was already available in the leaderboard, we're just bringing it into Intelligence. 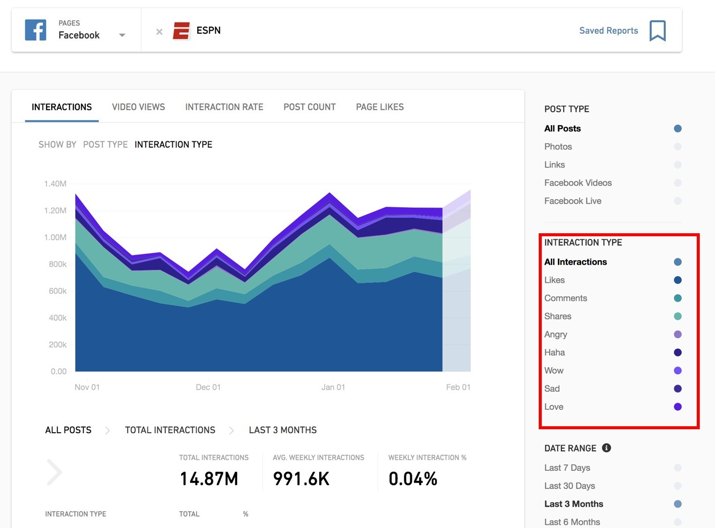 Add a leaderboard (“as publisher”, “as marketer”) that rolls up Branded Content post data on the account level in Page Details (4/3) This is the same data that was already available within our tool, we're just taking out a few clicks to simplify a common use case. 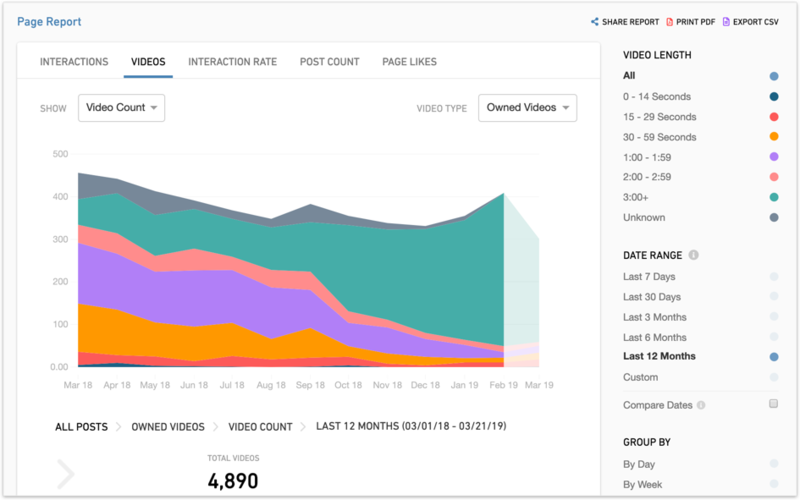 Add additional metrics to our Branded Content leaderboards (4/3) This is data we already have in our system, we're just doing some math in a standardized fashion to simplify the process for partners. Metrics include: % of Video Views on Branded Posts, % of Video Posts on Branded Posts and Interactions Per Branded Video. You can now filter for Facebook videos but exclude Facebook Live videos via the Facebook Non-Live post type. View video length on any post and filter the post stream by video length via a slider (ie. posts over 3 minutes) and sort by interactions or overperforming. In Intelligence, you can view video views and video count by video length and total video time. 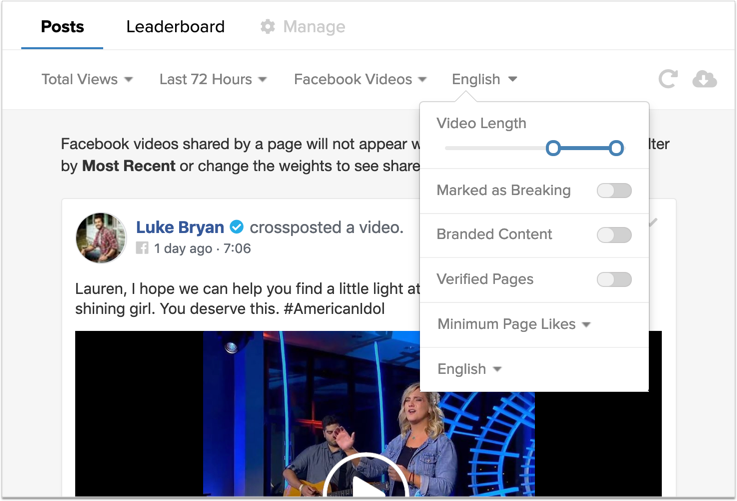 In the Owned Video Leaderboard, see total view time, plus the total number of — and percentage of — 3+ min videos (in hover and export) at the page-level. As well, you can now export video length data from the post stream, leaderboard and historical data. Read more about video length here. In Dashboard Settings, you can now set the dashboard to default to Total Interactions, Most Recent, Underperforming, or Interaction Rate. Before Overperforming was always the default unless you sat a default on a list. You can how search and filter for Instagram Branded Content just like in a Facebook dashboard. This data is also available in leaderboard form. See article for more information. Add "Marked as Breaking" filter for Viral Alerts (2/6)You can receive viral alerts (via email or Slack) for Facebook posts that are "marked as breaking" which is also available in Live Displays and Dashboard streams. You can filter for Instagram album posts from a dashboard stream. Album posts are listed as post type alongside photos and videos in Leaderboard tooltips and CSV downloads. We replaced the cumbersome Slack integration using webhooks with a simple "Add To Slack" button using our official Slack App. Learn more here! We now support the Instagram Album post type. Long time coming! It is not yet filterable but you can know see all the images and videos in a native-like carousel format. In the coming weeks, we will be making it a first-class post type along side video and album post types. You no longer need to add a Page, Account, or Group to an existing List in one of your Dashboards in order to pull it into an Intelligence graph! Now when you use the Intelligence search bar to find a Page, Account, or Group a message that says "Not seeing what you're looking for?" will pop up. If you click on it, it will show you Pages/Accounts/Groups that are not yet in the CrowdTangle database- each with the word "Add" next to them. Clicking on "Add" will add it to the database and the Intelligence graph. Note- Facebook Verified Profiles still need to be added to a LIst in one of your dashboards before being added to an Intelligence graph. It also may take several minutes for historical data to show up. You can read more about it here. The Explore Section in each of your Facebook, Instagram, Reddit, and Twitter Dashboards has been improved! You can now filter Lists by tags and browse by more useful categories (including new ones like Social Issues and Communities). Explore Lists added to your own Lists will now updated automatically when CrowdTangle updates them. Explore Lists can now also automatically be accessed in Intelligence or Saved Searches without having added them to your own Lists first. Finally, Account Owners can now publish custom Lists- making them available to all of their Account's users in the Explore section. Learn more here. As a part of Facebook's continuing efforts to battle false news on the platform, you can now identify link posts as false in your CrowdTangle Facebook dashboards. We're currently testing the validity of this as a signal for our misinformation team! You can read more about the feature here. You can now add Lists to an Intelligence graph as long as the List has no more than 500 Pages, Profiles, accounts, or subreddits in it. CrowdTangle can now track Verified Facebook Profiles that have been set to allow anyone to Follow them. These can be added to Lists, Intelligence graphs, Searches, and Leaderboards in the same way you add Facebook Pages. You can now access Live Displays and Intelligence by navigating to the top of CrowdTangle in your browser. Additionally, the Live Display drop down now shows you "Featured Live Displays"- public Live Displays created for you by CrowdTangle- and any recently visited Live Displays of your own. The Intelligence drop down will also allow quick access to your saved reports. Intelligence will now allow you to filter by specific reaction types in the Interaction Types filter on the right hand side. Fixed an issue in Link Checker and the Chrome Extension where searches would sometimes miss original links. You can now leverage the CrowdTangle API to get view count from Facebook and Instagram. Downloaded saved posts will now download the whole set when set to "my order"